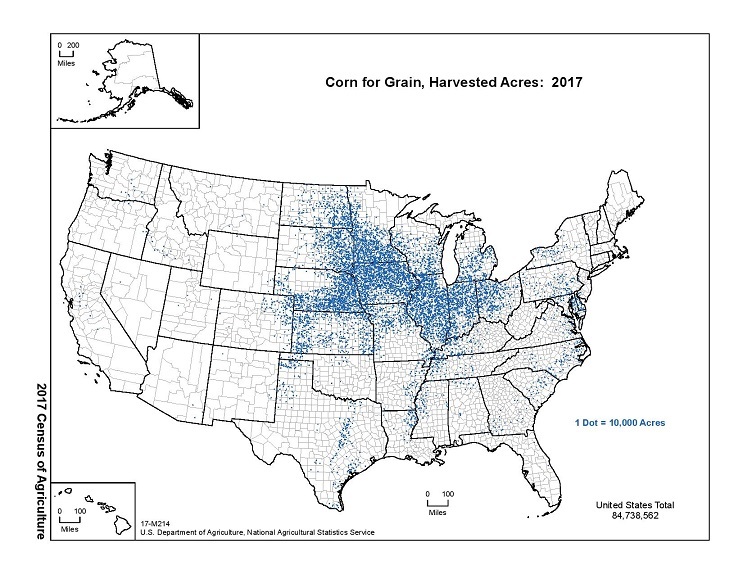 THE number of farms and the area of land under agriculture have declined slightly in the United States over the period from 2012 to 2017, according to the latest Census of Agriculture released by the US Department of Agriculture (USDA). 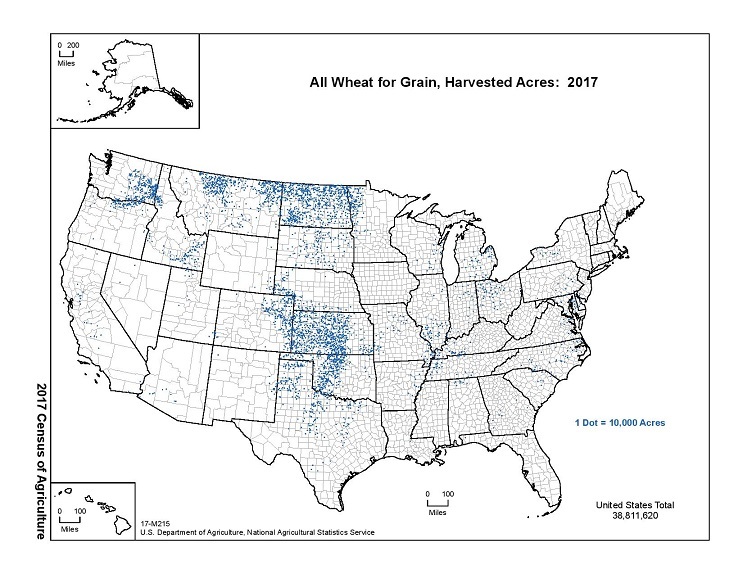 Comparing the trends since the last census in 2012, the 2017 census shows an increase in the largest and smallest operations and fewer middle-sized farms, and a continuing rise in the average age of farmers and ranchers. 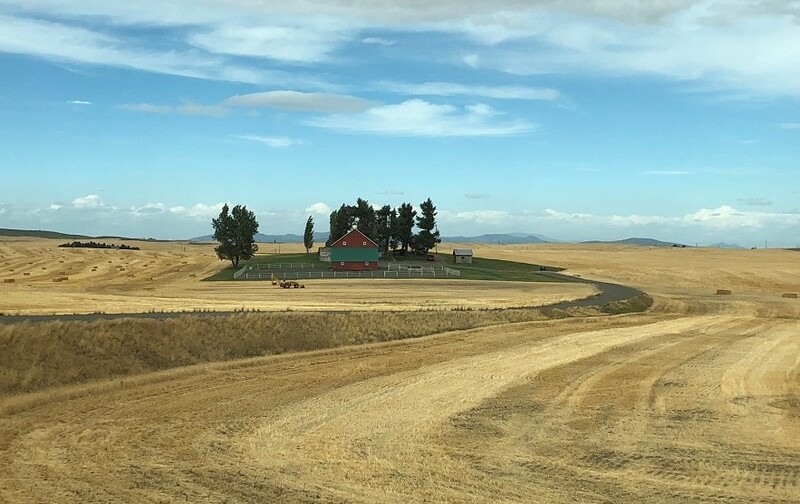 There are now more than 2 million farms and ranches in the US, run by farmers with an average age of 57.5 years who annually turn off US$389 billion worth of agricultural production. By comparison, the 2015-16 Agricultural Census run by the Australian Bureau of Statistics (albeit using slightly different parameters to the US census) found there were 85,681 farms in Australia with an average size of 4331ha producing A$56 billion worth of agricultural produce. 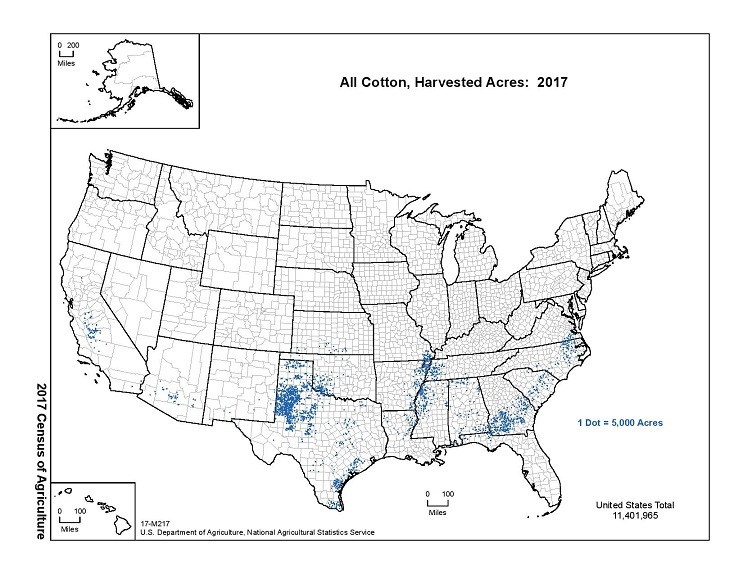 There are 2.04 million farms and ranches (down 3.2 per cent from 2012) in the US with an average size of 178 hectares (up 1.6pc) on 364 million hectares (down 1.6pc). 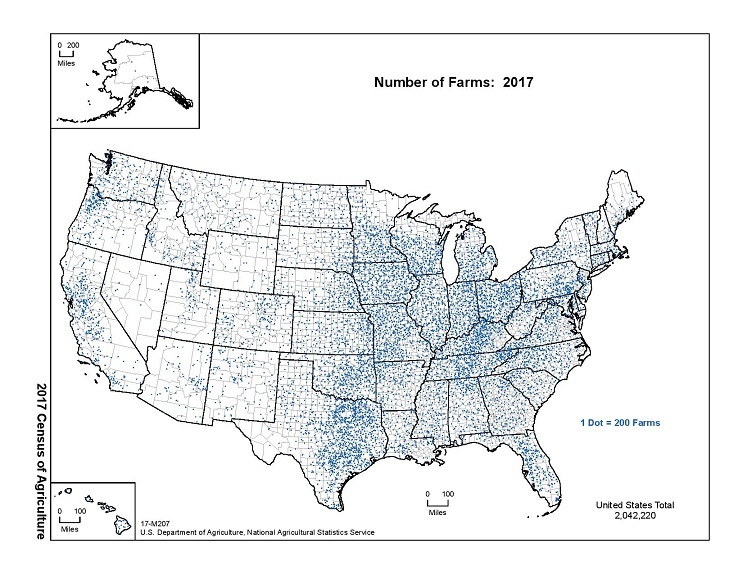 The 273,000 smallest farms (up to 3.6ha) make up 0.1pc of all farmland while the 85,127 largest farms (800ha or more) make up 58pc of farmland. Just 105,453 farms produced 75pc of all sales in 2017, down from 119,908 in 2012. Of the 2.04 million farms and ranches, the 76,865 making US$1 million or more in 2017 represent just over two-thirds of the US$389 billion in total value of production while the 1.56 million operations making under US$50,000 represent just 2.9pc. Farm expenses are US$326 billion with feed, livestock purchased, hired labour, fertiliser and cash rents topping the list of farm expenses in 2017. Average farm income is US$43,053. A total of 43.6pc of farms had positive net cash farm income in 2017. 96pc of US farms and ranches are family-owned. Farms with Internet access rose from 69.6pc in 2012 to 75.4pc in 2017. In 2017, 130,056 farms sold directly to consumers, with sales of US$2.8 billion. Sales to retail outlets, institutions and food hubs by 28,958 operations are valued at US$9 billion. The average age of all US producers is 57.5, up 1.2 years from 2012. The number of producers in the US who have served in the military is 370,619, or 11pc of all. They are older than the average at 67.9. There are 321,261 young producers aged 35 or less on 240,141 farms. Farms with young producers making decisions tend to be larger than average in both acres and sales. 36pc of all US producers are female and 56pc of all farms have at least one female decision maker. Farms with female producers making decisions tend to be smaller than average in both acres and value of production.